Oscar De La Hoya knows a thing or two about pay-per-view. During his boxing career, the former multi-time champion was part of some of the biggest cards in the history of the sport including at least four cards that sold over 1 million buys. His 2007 showdown against Floyd Mayweather stands as one of only four events to ever do more than 2 million buys. In recent years with his own career behind him, De La Hoya has transformed into one of the biggest boxing promoters on the planet while working with fighters such as Saul ‘Canelo’ Alvarez. At Golden Boy Promotions, De La Hoya has once again had his hands in several highly lucrative pay-per-view cards but just recently he helped orchestrate a massive $365 million deal to put ‘Canelo’ on DAZN streaming service for the next five years. While streaming deals aren’t necessarily new, De La Hoya is moving a proven draw in ‘Canelo’ out of pay-per-view to a new avenue for fans to witness his performances. 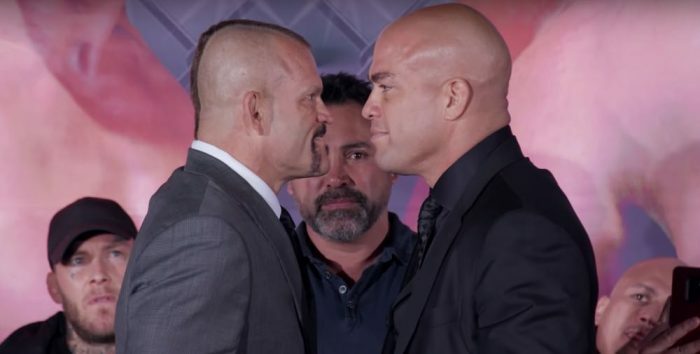 This weekend, De La Hoya will return to a more familiar ground, however, when he promotes the trilogy fight between Chuck Liddell and Tito Ortiz for $40 on pay-per-view. It’s the first foray for Golden Boy into mixed martial arts but De La Hoya has sounded confident every step of the way that this venture would be a success. Given the deal he just struck with DAZN and the upcoming event with Liddell vs. Ortiz 3, where exactly does De La Hoya stand on the future of pay-per-view? “I think the future for boxing is on the digital platform,” De La Hoya said in an exclusive interview. “I think fight fans want to see great matchups and great cards from top to bottom. The UFC has been doing a great job and putting on some great fights. Therefore, MMA and the UFC will survive on that pay-per-view platform. De La Hoya joined fellow boxing promoter Eddie Hearn on DAZN after he signed an even more lucrative deal to bring his fighters — including heavyweight champion Anthony Joshua — to the platform earlier this year. Meanwhile, FOX just recently inked a new four-year deal with Premier Boxing Champions (PBC) reportedly worth around $60 million per year to produce 10 ‘marquee’ fight night cards per year. Now it must be stated that there is a very high profile heavyweight title fight between Tyson Fury and Deontay Wilder headed for Showtime pay-per-view on Dec. 1 that is expected to draw a sizable audience. It also can’t be forgotten that just last year, a sideshow boxing match between Floyd Mayweather and UFC superstar Conor McGregor ended up as the second biggest card of all time with more than 4 million pay-per-view buys. Still it seems like boxing is moving further and further away from pay-per-view with deals like the one De La Hoya struck with DAZN and the PBC inked with FOX. That said, De La Hoya still believes organizations like the UFC can thrive on pay-per-view for the time being and probably for at least a few more years. The UFC just recently signed a new five year deal for their broadcast rights to go to the ESPN family of networks but promotion still plans on putting on 12 pay-per-view cards per year. In fact, the UFC just held the most lucrative card in company history in October when McGregor made his return to action against lightweight champion Khabib Nurmagomedov with the event reportedly selling around 2.4 million pay-per-views. “I think the pay-per-view model in MMA and UFC will still last for quite a few more years but it’s totally changed for boxing,” De La Hoya said. By all accounts, De La Hoya is at least right on the money when it comes to the UFC because by all accounts it doesn’t seem like they are even exploring any other options. Obviously, boxing will still manage to put on a few big fights each year on pay-per-view but it definitely seems like those options are dwindling with superstars like Canelo and Joshua opting to move to streaming services going forward.